Bathrooms are not just for taking baths anymore; They are an oasis of serenity where we go to revive ourselves. The inside of your private retreat should reflect this. You may not be able to transform it into a four-star retreat, but with some imagination and a little work it can become your own hideaway that matches your personal taste. Some of these ideas are inexpensive refreshers that can be carried out in an hour two and some are more substantial and may require a little outside help. One of the easiest ways to change your bathroom’s look is with a new rug. A basic floor mat in a geometric pattern can change the whole feel of a room. If you look at pictures of upscale bathrooms magazines, the centerpiece rugs are often straightforward and inexpensive. A vase that you fill with fresh flowers can be very enticing. Roses are supposed to be cut before they go to seed so a local green space won’t mind you clipping some a few times a week. If that works for you, station a potted fern nearby to bring out the color and freshness. A low stool to sit on that can be tucked under a counter will help you enjoy these touches. Changing out an old lighting fixture for something a little nicer and more dramatic is relatively inexpensive and can add a nice touch. Lighting stores have hundreds to choose from. You can bring one home and hold it up to the wall to see if you like it. If not, you can return it and exchange it for something you like better. Fixtures are easy to install. After turning off the circuit breaker to the room, you or someone that you know who is handy may be able to do it. While you’re at the lighting store, see if they have any large framed mirrors that you like. Clean all the clutter out of the drawers and store it in a box somewhere else. Find some nice dividers at Pottery Barn and tidily arrange the things you really use. While you’re there, pick up a counter top rack for some nice rolled up towels and add a jar or two of nicely scented soaps in the middle. Racks with towels and soap can also be mounted on the wall. Before you buy anything take a good look at the paint and ask yourself if you are tired of the color. 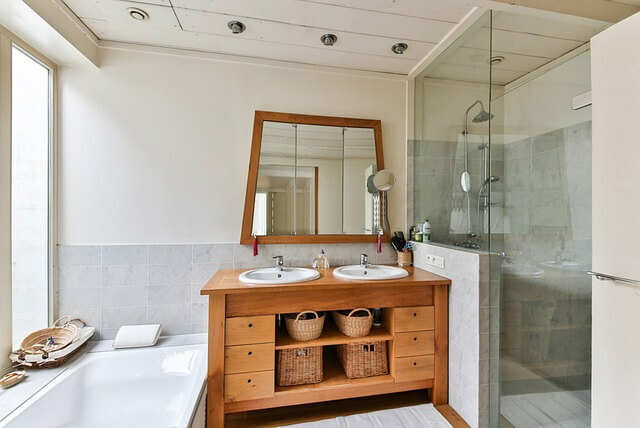 Most bathrooms are small and can be painted in a day. Two different colors that compliment each other and that match the accessories that you are adding will add a modern touch. Overall, try to remove as many non-essential things as you can to give the room a simple focus. Leave as much open space as you can and avoid clutter. If you can have room, by all means install a nice tub so you can relax in the lap of luxury. For a final touch, add a nice radio that tunes in a relaxing jazz or classical channel.